Amazing and Beautiful Venue! Jodi is the BEST! This review is for both the venue itself as well as for Jodi and her team. We cannot say enough amazing things about Jodi and her team! She is one of the most friendly, organized, and helpful people we have ever met. Her entire goal is to make sure your day is successful and perfect. Whenever we would visit her she would greet us with a smile and always seems so excited to see us! From the very beginning all the way until the day after the wedding, she was extremely helpful and so very sweet and kind. She (figuratively) held our hand through the entire process and was really helpful when making suggestions and answering questions. We had a few requests and it really didn't seem like there was any request too small or too large. If she didn't know the answer to something she would say "I'm not sure, I'll look into it!" and then would actually get back to you with an answer quickly and without prompting. It's incredible that regardless of the number of events she has going on at the time, she still makes you feel like your event is the only one she has going on all year. For the day of, she was so excited for us and was instrumental in making sure everything went smoothly. In regards to her team: while the venue is beautiful on it's own, they really made the entire wedding magical. The way the rooms were set up was nothing short of enchanting. We elected to have Jodi's team help us out with setting up some of our personal decorations (for a reasonable additional fee) and while we had pretty detailed directions on how we wanted the decorations displayed, they set them all up perfectly and exactly to specification. AND THE FOOD! The food was so good!! I feel that at weddings the catered food is always somewhere between "this is alright" and "meh." But the chef and staff are so talented and will work with you to build an amazing and delicious menu. Even though we can have some strong preferences on tastes, they were very adapting and accommodating. The location was extremely beautiful! They are constantly updating the venue and made sure everything was picture perfect the day of. The outdoor areas were calm and peaceful and particularly lovely next to the pond and the ceremony site was exceptionally beautiful. The indoor area was modern and updated but was not off-putting nor void of character. All in all it is the perfect location for any event, especially for such a beautiful wedding. Absolutely beautiful property! Jodi is the best and handled everything so well. All of my wants and needs she provided and I appreciate her always responding to emails and giving suggestions. The property is such a great value for the price... so much included! Props to the chef.. the food was AMAZING! I want to get married over and over again here!! Everything you could want in a wedding venue and more! Cypress Ridge Pavilion far exceeded our expectations of a dream venue. We were so ecstatic that we came across this venue during our venue search. From the moment we visited the venue, we knew that it was the place we wanted to get married. We visited the venue on a Saturday afternoon right before a wedding. The atmosphere was so calm and serene that we was surprised to find that there was a wedding happening that day! That's when we knew it was the venue for us. Jodi, the venue coordinator, was amazing to work with through the whole process. She was so accommodating and such a joy to work with. Jodi truly helped us make our vision come true and we trusted her that everything would run as smoothly as it did! She helped us process all our thoughts and visions and everything turned out perfectly. The food was phenomenal. We scheduled a tasting before the wedding and were accommodated to our own sit down tasting. We were able to pick and choose what we wanted and weren't limited to any decisions. Post wedding all our guests said it was the best wedding food they had. Not only is it a beautiful venue, but all the staff went above and beyond to make our wedding day perfect. All in all we would 100% choose Cypress Ridge Pavilion as our wedding venue again. We loved everything about this Wedding Venue and here is why. Starting out we made inquiries to several wedding venues in the Arroyo Grande/Pismo Beach area. Jodi, the Event Coordinator from Cypress Ridge Pavilion was one of the first people to write us back. She set up a meeting for us to come see the venue and sent us a full detailed wedding packet with costs of all their services and food up front. We met up with her a few days later and toured the Pavilion and surrounding grounds. She was very helpful at answering all our questions and not at all pushy. We decided on Cypress Ridge Pavilion for our wedding, Jodi sent us all the paperwork electronically which made things very easy for us because we did not live in that area. Moving forward from there, we began booking our other service providers. By them including most of the rentals and providing in house catering they are able to better control the level of service and in turn streamlines a big part of the wedding planning process for you. The only additional vendors we had to book was a DJ, Photographer, Pastor, cake and Florist. Jodi had a list of preferred vendors that they had worked with in the past to make this easy as well. Moving forward to the wedding day, Jodi was there early making sure everything was set up as we had requested and available to answer any questions we or the other vendors had. Our wedding turned out beautiful, the grounds were neat, clean and lusciously green; the tables, linens and dinnerware were perfect, everything was as requested. We decided on their Italian buffet option for our dinner which was amazing, lots of flavor and more then plenty of food for everyone. Also decided to go with the premium open bar, guests loved it and many were jolly and rosy cheeked by the end of the night. Jodi stayed throughout the night helping in any way she could to make sure everything went smoothly. We could not have asked for a better place to get married. My wife Crystal and I had our wedding here, and we can't recommend it highly enough. The wedding day coordinator (included in the venue cost) helped us through the entire process, giving us helpful reminders and advice. In the end, the wedding went off without a hitch, and I'm so thankful we got married here. After all, weddings are stressful enough, and it would have been a shame to spend so much time and money on a wedding that wasn't fun. All our guests complimented us on what a great time they had, how awesome the food was (thanks Chef Rochelle Friedman! ), and how beautiful the place was. Thanks to Cypress Ridge, Jodi Sailors (coordinator), and Chef Rochelle for being such a big part of our special day. Cypress Ridge has my highest recommendation. Do not be afraid to contact Jodi with your questions. 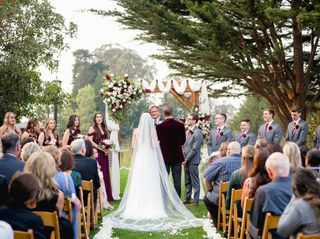 Cypress Ridge is the best and most beautiful venue on Calif.'s central coast! Jodi helped us throughout the entire wedding process and Jodi knows exactly how to organize the rehearsal and help the entire day of the wedding. And Rochelle is the most fabulous chef! The Cypress Ridge Pavilion exceeded our expectations as a venue for our wedding. The whole atmosphere and ambiance of the place are great. We keep getting compliments from our guests about how great our wedding was and how beautiful the Pavilion is. One thing I have to say is that the staff is absolutely great. Jodi, the Event Coordinator, makes you feel right at home and really was there to make sure our day went off without a hitch. She went above and beyond what was expected. Here is a tip for people who are considering this venue. We did our dinner on the grass by the lake and then the dancing inside the main hall. It worked out great! We also did our rehearsal dinner there the night before the wedding. Which worked out great as it really streamlined the day and let us really enjoy our friends and family. We can't thank the staff enough for making it the best day ever. I cannot say enough good things about Cypress Ridge Pavilion. My husband and I got married here last June and it was just perfect! 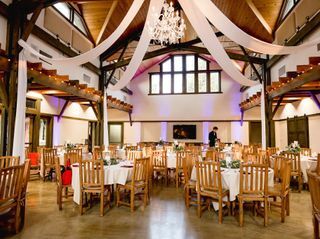 When we were hunting for a venue we wanted something that felt inviting, cozy, magical but also big enough to hold our large wedding and this place nailed it! Cypress Ridge is in a gorgeous area, with a fantastic wedding ceremony lawn on a lake. We fell in love with the venue the moment we walked in. Jodi was probably the main reason we even decided on Cypress Ridge. Throughout our wedding planning process, Jodi worked closely with us on every detail, and we had a lot of details! From helping get the decorations set, to hooking us up with an amazing florist to even keeping me calm before walking down the isle - Jodi rocked it! She was with us every step of the way and I always felt supported. The food is also just amazing! My mom and I worked closely with Rochelle on every detail of the menu, due to some food allergies, and she was super accommodating. I am still getting rave reviews about the food! Also, we had s’mores set up at the fire pit in the evening and that was a huge hit with our guests. In terms of the venue itself, we had dinner outside on the lawn and moved our guests inside for dancing. There was enough space for everyone, but it still felt cozy and intimate. In the evening, there are hanging lights outside that really make it quite stunning and make for a very warm ambiance. If you’re on the fence, don’t be. Cypress Ridge Pavilion is not only a beautiful place to get married, but the team who works there makes it magical! Best. Venue. Ever. We had THE most amazing wedding! We are so happy with how everything turned out! Jodi is the best coordinator! She did such a great job helping us plan the best day. We cannot thank her enough. All of our guests are still talking about how beautiful the venue was. I loved that we had the option of an indoor/outdoor wedding. We have also been getting compliments on how great the food was (Santa Maria style BBQ)! The staff was super friendly. All around it was more than we could have imagined! I would highly recommend booking Cypress Ridge Pavilion for your wedding!! We loved this venue! You get so much for the price you pay! And what a beautiful venue, nice style, big bathrooms, nice surroundings. Our guests loved it. Jodi was nice, helpful and accommodating. We planned our wedding from Indiana and could have not been able to handle it all without her. No chasing after linens, dishes, service staff, tables, etc...we are so happy we chose Cypress Ridge Pavillon! My son and daughter-in-law had their wedding at The Cypress Ridge Pavilion. Their wedding was magical and couldn't have been more lovely. Jodi was wonderful and she spent as much time with us as we needed to make all of the decisions. She was extremely welcoming and helpful. We even came out for a tasting before the wedding which was eloquent! I was mostly involved with the rehearsal dinner. We had decided to have the dinner at the same location as the rehearsal especially for the convenience. We were so glad that we did! We ordered the bar-b-q dinner with a few changes. The chef worked with me to select the perfect menu and that it was! The evening was perfect, the food exquisite, the staff friendly and professional. I couldn't have asked for more! Thank you for helping create wonderful memories for our families and friends. My Husband and I (06/11/2016) are from two different parts of California(Southern and Northern) and because we did not want to be biased we decided to meet in the middle. We looked at a lot of venues but the moment we drove into Cypress Ridge we just KNEW it was it. The scenery was absolutely beautiful and calming! Our big day was everything and more! Jodi and her team were absolutely phenomenal! She truly is a godsend any problems or issues she was there! If I could do it all over again I would in a heartbeat!! Oh and the food!! Our guests are STILL talking about how amazing the food was!! Thank you so much Jodi for all of your hard work and dedication to make sure our day was amazing!! My husband and I couldn't be happier with our decision in having our wedding at The Cypress Ridge Pavilion. Not only was they layout of the venue perfection, it was beautiful and the staff was phenomenal. Jodi the events manager is such a pleasure to work with. I myself am a wedding planner and have been to many venues, it says a lot that I chose this one for my own wedding day. I love that so much comes with this venue. Not only do you get the gorgeous property for your ceremony, cocktail hour and reception, they cover the food with their in house catering (which is top notch, Rochelle is an amazing chef), they cover the bar, they have a bonfire pit that is clean and chic, a pond backdrop, photo booth, an amazing bridal suite that we also used as a kids room, and so much more. If your considering this venue for your wedding, seriously look no further. Love love love this place. We wanted our wedding to be a party with a ceremony in the middle of it and Jodi and Rochelle simply made it happen! The Pavilion is a beautiful venue with great architecture and outdoor amenities and scenery. Jodi handled our requests and concerns in a very professional manner and she's a lot of fun too! They accommodated the live band perfectly and the delicious food prepared by Rochelle was out of this world. Everyone who attended has made glowing remarks about the Pavilion and the great staff - and we could not have selected a better place for our 'wedding party'. They're the BEST! The natural beauty of the Cypress Ridge Lakeside Pavilion and surrounding landscape enhanced our emotions and affections that we embodied on our daughter’s wedding day. The detailed service we received from our first call, to the moment our daughter exited a new bride helped us all truly experience the love shared by family and friends. Big kudos and a sincere thank you to Jodi and staff for your dedication and remarkable service. Made our dream come true This place was the most beautiful setting for a wedding. It was amazing and made our day absolutely breathtaking. Jodi was a blessing to me as well as my big day. She went above and beyond. I could not have asked for a better day. How I found this place, I looked up best food. Then we arrived to view it and there was no way that we could walk away without booking. It was perfect. The food was beyond my dreams and my guest actually said that they thought our wedding should have been on one of the wedding shows. If you are looking for a romantic beautiful perfect wedding location this is it. I also had the most amazing live musician Timothy Davis who definitely set the mood and our officiant Melodie Willey who had everyone in tears with the amazing vows written just for us. Jodi worked with all of our vendors and made our day more then we could have ever imagined. If Elegant and Breath taking is what you are looking for choose Cypress Ridge and they were great working with our budget. 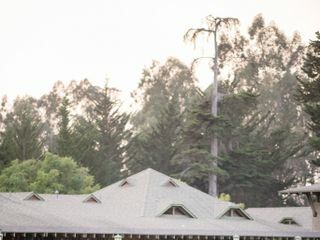 I recently had my wedding at Cypress Ridge Pavillion and I could not have had a better experience. I would consider this the go to place for weddings in the area! I loved having the catering, rentals and coordinator included with the venue, it made service efficient and seamless. They even let you pay as you go so you don't have to worry about a big bill at the end of your wedding day! We had our ceremony and dinner outside and the rest of the reception inside and it truly felt like each spot made for a new experience (and fun new pictures). The space is beautiful as is but still allowed us to add our personal touches to make it feel like OUR wedding. We asked for a set-up that was new to the venue and they went above and beyond to make it happen and even tested the layout before the day to make sure it would work. When looking at the venue information you may see certain limitations such as no BYOB for alcohol. However, when talking to the coordinator, Jodi, she was very accommodating with all our requests, including those alcoholic, and made everything we asked for happen. We were never met with a simple "no" but were delighted to have suggestions as to how to achieve our dream wedding within the venue's boundaries. I would not hesitate to have another event at the Pavillion or to recommend it to another bride. Only the best from Cypress Ridge Pavillion. We had our wedding there 08/17/14 and it was the most amazing day I could have imagined. Jodi and Bryan really helped make everything we wanted happen. Jodi was always so easy to get a hold of and she had all the answers to our problems. From planning 6 months ago to the big day they where all so willing to help us. They gave us suggestions on vendors, and offered decorating ideas. Jodi connected us with the right people to get a chandelier and fabric for our big day and even helped us figure out how to mount it all. She met with us a couple times the week of to make sure we knew what was going to happen and did an amazing job guiding a walk through with us the day before. The morning of the wedding we arrived at 10am to see the chef picking fresh rosemary for the dinner that night and Jodi directing people how to set stuff up etc. I had a meltdown and she was there to help, we needed anything she was there all day and night she was just the best onsite coordinator we could have asked for. I loved the venue and all of the staff that worked the event. Everyone was so professional and nice. We really loved the chef as she met with us several times to perfect our meal to our preferences. We had olives on the tables with bread while everyone was getting seated. A plated salad which was out of this world was then served and finally we had a buffet style dinner. The dinner had the most amazing fresh vegetables (the asparagus was perfect not mushy at all as most buffets tend to have mushy veggies) an amazing vegetarian option that guest where raving over, sweet potatoes and my favorite part the prime rib! I loved how the chef cut the prime rib to order and it was so juicy and delicious. All of our vendors did a great job and raved over how well the whole day had gone.At the nights end they did the cleanup and we went off to our honeymoon. I didn't lift a finger without someone being there to it for me. I couldn't have asked for a better experience. We just had our wedding at Cypress Ridge Pavilion on July 12, 2014. It was beautiful! The price was great, and Jodi was excellent! We only looked at two venues before this one and we knew this was the one. Everything turned out great and many people told us it was the best wedding they have been to. It is very nice that they have in house catering and they do the tables, linens, chairs, umbrellas, heat lamps, etc... It is nice to not have to go through other venders and Cypress did the set up and break down as well. We didn't have any problems or hiccups at all. I highly recommend this venue! Cypress Ridge Pavilion was the clear winner when we searched for a wedding venue. 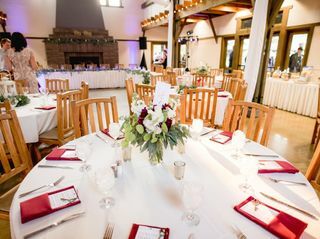 They had everything we were looking for in an event space including a beautiful location, helpful staff, catering on site, many rentals included and a great value! This venue really has it all. Planning a wedding from overseas can be stressful, but Jodi made it so much easier. She was incredibly responsive and flexible working with me and my husband during that entire year leading up to the wedding. I cannot thank her enough for putting my mind at ease and making sure everything went off without a hitch. On the day of, Cypress Ridge did not disappoint. We had an amazing and beautiful wedding from the ceremony, to cocktail hour, to our reception. It was absolutely stunning and it was exactly what I had always wanted. Jodi and her entire staff at the Pavilion are truly wonderful and I can’t thank them enough for all of their time and assistance in making our wedding so memorable. Excellent venue, and the staff was oustanding! My husband and I had our dream wedding at the Cypress Ridge Pavilion. The venue was breathtaking, the service was fantastic, and the food was beyond delicious (guests couldn't stop raving about the wonderful food!) The food was even tailored to our Scottish/Celtic theme by their talented chef, Rochelle, who sat down with my husband and I and discussed a personalized menu. We were so impressed by the event coordinator, Jodi Sailors, and she made sure that every detail was discussed and fit our needs. She exceeded our expectations and we were so lucky to have her help us plan a wonderful wedding. We had a Scottish wedding, kilts/bagpipes and all, with a beautiful outdoor ceremony facing the lake. The reception was indoors and fit our theme perfectly. Guests kept telling us this was one of the best weddings they've ever been to, if not THE best. After over a year of planning my wedding I was amazed that my wedding turned out as glorious as it did. The Cypress Ridge Pavilion made my dream wedding turned into a reality. Not every woman gets the wedding she dreamed of as a little girl but I had that wedding and more! I sincerely recommend this venue to anyone that wants a spectacular wedding or event here. You will NOT be disappointed and will have a fabulous time. We held our daughter's wedding and reception at Cypress Ridge Pavilion and had an exceptional experience. Both wedding and reception were outside with the Pavilion used for dancing. We also had S'mores at the fire pit. The venue provided an attendant for that, which was helpful. (We had no safety concerns). The event coordinator Jodi and the staff were extremely professional and helpful. Jodi was great during the planning phase--answered all of our emails in a timely manner, and helpful with suggestions. The wedding was beautiful and fun! I would recommend the Cypress Ridge Pavilion to any bride. If I could give Cypress Ridge Pavilion 10 stars, I would! I had my wedding at Cypress Ridge in October of 2013, and had 5 months to plan a wedding with 200 attendees. To top it off, I am in Northern California, and so this was going to be a semi "destination" type of affair, and I had a limited number of trips I could make down before the wedding date. Of the larger venues I looked at, Cypress Ridge definitely beat the rest in the value, flexibility, and quality of services they offered. First of all, Jodi the event coordinator there is AMAZING. I love this woman! From the moment I spoke with her on the phone to our first meet and greet, she was always responsive, timely, and just so much fun! She will do everything in her power to give you the vision you want to see on your wedding day. I really wanted an outdoor reception, and she made it happen. We asked for some changes to the food, and whether it was a family style menu and different sides than normally offered, Jodi worked to get us options not on the list. She even found a way for us to taste the food on a weekend we could come down by coming to a different event and having us served in her office (haha!) PS, the food was great!!! Speaking of budget, you can't beat Cypress Ridge. 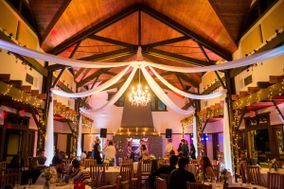 The venue is such a great setup for those who want to have their ceremony and reception on the same venue site, and what is included really helps take care of many extra costs that add up quickly. From setup, tables, chairs, linens, silverware/barware, servers (in the service fee), the fire pit onsite etc., there are a lot of perks that come with the venue. We also had the ability to come in early to drop off things or pick up things the next day. I cannot say how truly thankful we were to have such an amazing venue!!! Our guests had nothing but raving reviews about the beautiful venue, great atmosphere, and fantastic dance party in the pavilion. I promise if you have your wedding at Cypress Ridge, you wont regret it.